A thesis delivered at the department of humanitarian studies at the university of Göteborg. That bound to be one of these preposterously expensive academic publications, right? Well, not this time. The book is available for free as a PDF from the university’s website. Click on the cover. The book caught my attention because of the subtitle: “Arturo Reghini and the Antimodern Reaction in Early Twentieth-Century Italy”. Reghini (1878-1946) was a Freemason, Traditionalist and is probably best known in the English speaking world for having been acquainted with Julius Evola. In spite of the relative popularity of Evola and the tremendous influence that Reghini supposedly had on the man, it is strange that close to nothing of or about Reghini has been translated to English. Giudice made a firm first step to change that. Being a thesis, the book has a lot fairly annoying academic style-forms. Pages filled with text for people who probably will not read the entire work. The first quarter of the book is filled with introductions to the subject, about the methodology, etc. Then every chapter is again summarized before it starts and ends with a conclusion (usually another summery). Of course there is a load of notes, references and a lengthy bibliography. In his book the author makes a lot of effort to portray Reghini in his day and age. He describes social sentiments and esoteric currents in the period leading up to Mussolini’s fascism. Giudice gives a history of Italian Freemasonry and how Reghini fitted into that history. The same with political developments. All this lays partly outside my interests, but context is usually interesting or at least useful and it, of course, explains how Reghini came to be himself. From early Theosophical involvements to “fringe” Freemasonry, as Reghini clearly saw the weak side of ‘regular’ Italian Freemasonry which he found too political. What is a bit weird is that the author uses the word “fringe” to refer to ‘irregular’ Freemasonry, while usually the word “fringe” means that an organisation is akin to Freemasonry, but not Freemasonry in itself. Of course Giudice says a lot about the Traditionalist milieu that Reghini moved in, a Traditionalism that Giudice calls “Roman Traditionalism” and sets against the “Guénonian Traditionalism” of René Guénon et al. Also Evola enters and leaves the picture. With his writings Reghini predated Guénon’s anti-Theosophical writings and Evola’s “Imperialismo Pagano”, so you can say that Reghini influenced both better known Traditionalists. The book shows an interesting investigation of an interesting man in an interesting period in time. Like I said, this is almost the first information about Reghini available in English, so hopefully this very good introduction will lead to attention to the Italian author and the translation of his works. 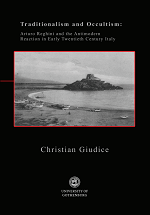 It would be nice of Giudice’s book would be made available in an affordable printed edition too. A nice bonus. The author translated “Imperialismo Pagano” at the end of the book, so there we have the first of Reghini’s writings in English. You can find a few quotes here.